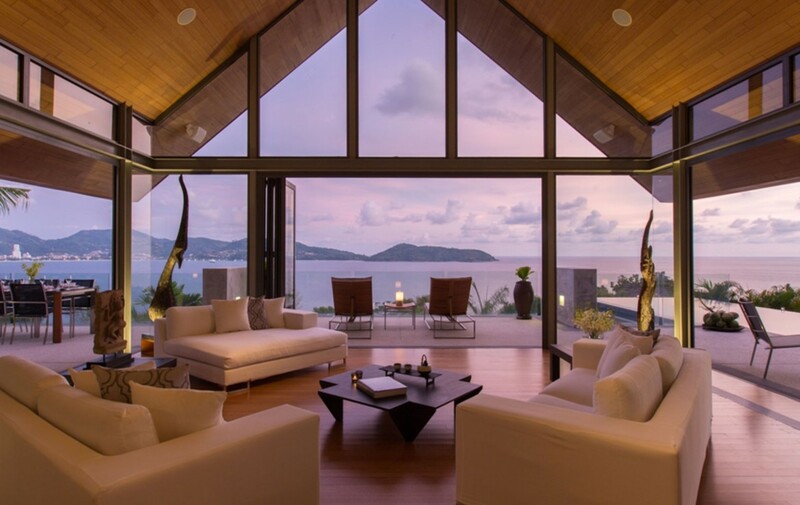 Villa occupies a breath-taking and very enviable location which affords stunning 270-degree sweeping ocean views encompassing the hills, town and beachscapes of Patong Bay out to the open ocean and sunset. Following the iconic and contemporary themes of the Original Vision architecture, Villa extols bold angles expressed with clean, minimalist lines. This premium location would be difficult to beat, Villa’s Complex is situated along the ‘Millionaire’s Mile’ between the world-class Kamala beach and SE Asia’s night-life capital, Patong Beach. Both are easily accessible within less than 10 minutes of driving. The five-bedroom property is approx. 800 sqm of living space over two main levels. The property is on a total of 2,977 Sq.m of Chanote titled land which comprises two plots in the estate. The villa is on a plot of 1,608 sqm or just over 1 rai. Whilst the other plot of 1,369 Sq.m is currently used as garden. This additional land plot can be sold on or built upon by a new owner, to either increase the size of the existing property or for a completely new standalone sea view villa. Upon entry Villa welcomes you with an amazing huge cathedral-like space, with vaulted ceilings and a fantastic floor to ceiling bi-fold glass door system to frame the spectacular panoramic views. The view sweeps from the night lights of Patong in the South, to the open ocean and it’s blue waters. The second bedroom is also located on this floor, whilst the impressive master and three further bedrooms are on the lower, garden level. Also, on this garden level is a fully equipped home cinema, as well as a communal lounge area. Villa has been lovingly maintained and is in an excellent condition. In fact, the owner has just completed a $150,000 USD renovation to ensure the property is flawless. Those buyers looking for new build standard should seriously consider this villa. The villa’s large kitchen / dining has recently been fully replaced it’s centre piece being a long-fixed dining table area which provides a focal point for socializing as well as eating. There is a substantial additional kitchen with stainless steel fixtures for commercial scale food preparation. The professional kitchen works incredibly well with the chef pushing out fabulous food for large numbers of guests. The party planners are particularly impressed as this makes the villa a prime party venue with seating for 18 overlooking the ocean with no need to bring in catering equipment. The property has extensive alfresco dining areas, including a BBQ and large dining table. Perhaps the most magical spot in the property is a covered hilltop sala area which provides an intimate setting for relaxing and to fully appreciate the truly spectacular views across the bay and to the sunset. 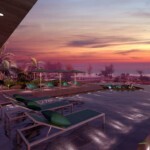 Further exterior facilities include wide terraces and sun decks with a 13m infinity-edge swimming pool. The pool area has a top-end outdoor sound system. Villa was constructed by Australian contractor Leighton in 2004, who were also responsible for the Estate’s infrastructure. This includes, full time security and estate office, 1 million litre rain water tank, fire hydrants and back-up generator. The estate is expertly managed and provides 24-hour security and maintains all common areas to an excellent standard. Currently, Villa is part of the very successful Estate’s rental management program. This is all in place and can continue if required. This is an extremely competitive offer for a property on the Kamala headland. Villa is a stunning super-villa with 5 bedrooms and breath-taking sunset views, sitting on almost 3,000 sqm of prime sea view land. 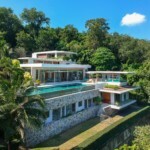 Offered at $5.5M USD with Thai Baht price adjusting to match the USD price.